Richard Hurst of the Ulster American Folk Park, Omagh, Co. Tyrone, Northern Ireland, announces that the lineup for this year's 22nd Annual Appalachian & Bluegrass Music Festival (Fri. 30 Aug.-Sun. 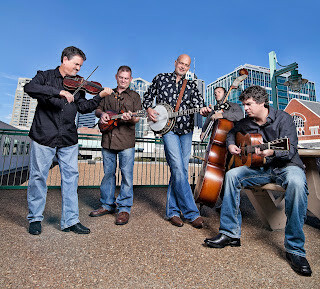 1 Sept. 2013) will include the Lonesome River Band (above), Cedar Hill (USA), Lynda Dawson & Pattie Hopkins of Kickin' Grass (USA), Rawhide (B), the Jaywalkers (GB; #3 European Bluegrass Band at EWOB 2012), Southern Tenant Folk Union (GB), and Irish bands Woodbine, the Broken String Band, Northern Exposure, Tupelo, Well Enough Alone, and the Down and Out Bluegrass Band. Further additions will be announced on the Park's website. The full announcement can be seen on the Bluegrass Ireland Blog. In addition to being the Festival organiser, Richard was a board member and chairperson of the EBMA 2008-9.